Posted on May 27, 2013 by Financial Underdog	in insurance, personal finance. Well, this is exciting! 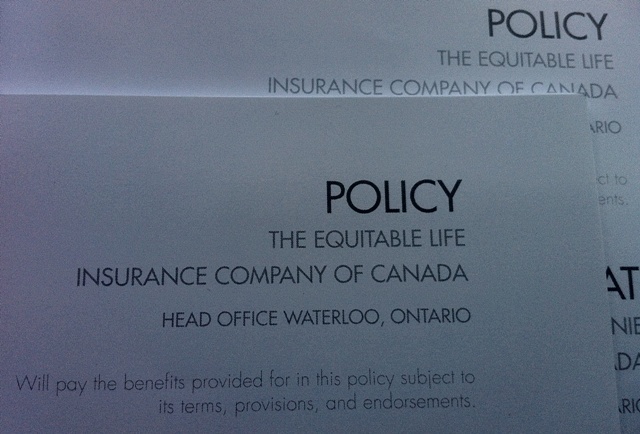 We now have life insurance! What kind of policy did we get? We’ve decided to go with a simple term life insurance (term = 10 years) with a bonus critical illness insurance. We can decide to renew the insurance once the term is up (although it will be considerably more expensive as we age), but at the moment it serves all our needs. While we’re in the accumulating wealth stage, we’d like to be insured against major events in life that will put us at risk – such as critical illness or death. The life insurance policy pays out in case of mine or my wife’s death (trust me, it was a very weird conversation about death – people usually try not to think about it let alone planning for it). We’ve chosen $750,000 as a payout – that amount would cover the complete repayment of our mortgage – currently around $200,000 and the balance would provide income replacement for either of us when invested conservatively. So, if I drop dead tomorrow, my wife will be able to pay off the mortgage, and not alter her lifestyle in any way because the income will still be there. The critical illness insurance covers a list of conditions that would trigger a payout. For example stroke, hearth attack, cancer, etc. This insurance would make sure we’re perfectly able to weather the short term storm of troubles such illness would bring – we wouldn’t have to choose between recovering from cancer or going to work to provide the paycheck. We could put money in the bank, stop working for a while and make sure we’re fully recovered before going back to work. The idea behind term life insurance is to protect us while we’re accumulating our wealth. Before being insured, if I dropped dead, my wife wouldn’t probably be able to maintain the lifestyle as is. She would probably would have to sell our house to get into something smaller as carrying our mortgage on one income would be hard. Ten years from now, we’re hoping to be completely self-insured – meaning with wealth accumulated and our mortgage paid off, my family would be just fine without my income. But right now it’s not the case – and that’s why insurance is critical. Also, we’re talking about having kids at near future – protecting them is also part of our plan. Surprisingly, not a whole lot. Our combined monthly bill for both of us is 132.34. That’s it! And what is $130 these days? A meal at a restaurant and may be a lunch together. By giving up an occasional meal, we’re gaining financial peace for our family knowing that we’re protected if the unthinkable happens. Sure, it’s still a $100 a month in added expenses, but it protects us from a world of financial hurt. Personally, I sleep better at night! Family is everything to me, and knowing that my family will be just fine if I get hit by a bus tomorrow – it’s money well spent. Interestingly enough, if you look at the breakdown of premiums, the life insurance part is less than half of the amount. Critical illness insurance is slightly more than half – simply because people are more likely to suffer from a critical illness than to die – especially in our age (early 30′s). One of the clauses in our policy actually specifies the repayment of our premiums if we don’t trigger the critical illness clause – so if we don’t use that part of the insurance, the insurance company will repay all of our critical illness premiums. Neat, eh? What life insurance doesn’t cover? Some conditions in our life insurance are not covered (and understandably so) – such as suicide, acts of war, dying in the process or result of illegal activity, and driving drunk. So, if I was to kill myself after having a few too many at dinner or jumped off the bridge – no payout. Makes sense, if you think about it. What was the process of getting it? Our financial advisor recommended we get it to protect ourselves. After doing some research on my own, and consulting with other people, we’ve settled on the specific amount, insurance company, and other details. It was a great relief for me that our advisor didn’t recommend us a whole life or universal life policies. The commission they get from them is much higher, but they’re terrible financial products. It’s good to know that our financial advisor has utmost integrity and chooses products that are good for us, and not for him. Once we’ve settled on details, we’ve been issued a temporary insurance that would cover us while we’re in the process of signing the documents. Your premiums depend on your health and family history, so the insurance company actually sent a nurse to our house one day to conduct a series of tests. A local nurse who is a contractor for life insurance company measured our blood pressured, asked questions about family history, took a pee sample (yes, you’ll have to pee in a cup), and some other tests. After they analyzed the results, they approved us at normal rate, and issued insurance policies. Now, if they were to find traces of drugs in our urine or find signs of tobacco smoking, our premiums would be astronomical – because the chances of getting seriously sick or dying are much higher in that case. Good thing neither me or my wife do any drugs. She never smoked in her life, and I quit about 4 years ago. – Life insurance for women is cheaper than it is for men. Because men are more likely to die earlier. – 41% of people in US do not have life insurance of any kind. – Recommended life insurance amount is usually 10 times your income. So, if you make $40,000/year, pick $400,000 as your payout at the minimum. We’ve also chosen to add mortgage balance into consideration – and the increase in premiums was quite minimal. That’s it for today. Feel free to ask me any questions about our process of getting life insurance. I’m The Financial Underdog, and I approve this message!